Anyway, even though we are slightly off of the strict Whole30 regimen, this recipe for Mango Ahi Poke is staying in our regular rotation. I think the coconut aminos* are the key. They are my favorite discovery from Whole30. Coconut aminos are made by aging coconut blossoms, and they are basically a good sub-in for soy sauce if you’re trying to avoid gluten or soy. Also, even though the coconut blossoms are aged with salt, coconut aminos have less than 1/2 of the sodium than soy sauce does. The taste is not exactly the same – coconut aminos are a teensy tiny bit sweeter, but they still have a deep umami flavor. *every time I type “aminos” my computer wants to change it to “amigos” which is actually kind of apropos since they are my new friend. Combine the coconut “amigos” and sesame oil in a bowl. Add the tuna and stir until all of the tuna is well coated. Add the mango and toss until just combined. Scoop the tuna-mango mixture into the avocado halves and top with sesame seeds, crushed macadamia nuts and sliced green onions. Serve immediately. We used to be friends with our neighbors Ashley and Brad. In fact, I would go as far as saying they were some of our best friends. But, just like they promised, we’re over the hump (HALLELUJER 🙌🏻) and actually feeling like we’ve got a little tiger blood in us! Here’s the thing with Whole30. It takes some work. There is menu planning and meal prep and not eating the chocolate that lives in your pantry. But also, there’s sleeping well and having more energy and feeling like a badass for being able to resist bread. Anyway, this is totally Whole30 compliant, but its something we’d eat whether we were adhering to Whole30 or not. If you’re not on Whole30 and you don’t feel like dealing with cauliflower rice or you just happen to really like regular rice better, then sub it in. You do you. In a bowl, combine all of the ingredients for the sesame sauce. Set aside. To make the cauliflower rice, remove the florets from the head of the cauliflower and place in a food processor. Pulse until they are resemble rice. In a sauté pan, cook the onions in the ghee until they begin to brown. Add the cauliflower rice and the garlic and sauté for 2-3 minutes. Season with salt + pepper. Season the flank steak with salt and pepper and drizzle with coconut aminos on both sides. Set aside. In a skillet, cook the bell pepper until it is softened and slightly caramelized, about 4-5 minutes over medium heat. Remove to a plate. Add the bok choy to the pan and cook for 3-4 minutes until it has wilted. Finally, add the shiitake mushrooms to the pan and cook just until they soften and brown, about 3-4 minutes. Add the flank steak to the pan and cook for 4-5 minutes on one side. Flip and cook for 5-6 minutes on the other side, or until it reaches your desired temperature – about 135 degrees for medium rare. Remove from the pan and slice across the grain. Fill the bottom of a bowl with the cauliflower rice, then layer the vegetables and meat. Top with the green onions, black sesame seeds, and drizzle with the sesame sauce. Big questions for the weekend… what are you putting on the BBQ: pork ribs or beef brisket? what kind of tunes will you be rocking to during the fireworks show: Texas country or throwback hip-hop? and what better way to celebrate the birth of our great nation than with patriotic mojito jell-o shots? Happy birthday, America! Celebrate big, folks. In a saucepan over medium heat, stir 1 c sugar into 1 c water until it dissolves. Lower heat to low and stir for another minute to cool. Slowly (very slowly! ), stir in 4 packets of gelatin, one at a time, whisking until dissolved. Remove from heat and stir in 3/4 c lime juice and the torn leaves from 6 mint sprigs. Let steep for 15 minutes. Remove the mint leaves and stir in 3/4 c rum. Add 5-6 drops of blue food coloring and stir to distribute evenly. If using a silicone ice cube tray, spray with Pam or other nonstick cooking oil and wipe lightly with a paper towel to remove excess. Pour 2 teaspoons of the mixture into each well. Refrigerate for 3-4 hours, until firm. If using a 9″ x 13″ pan, spray with Pam or other nonstick cooking oil and wipe lightly with a paper towel to remove excess, then pour the mixture on the bottom of the pan. Refrigerate for 3-4 hours, until firm. Repeat the process above two more times. Make sure to give it 3-4 hours to set between each layer. Leave food coloring out of the second mixture, and add red to the third mixture. If using a silicone ice mold, simply pop the Jell-O shots out of each well. If using a 9″ x 13″ pan, use a knife to cut squares and remove carefully. When I was a kid, one of my favorite family traditions was homemade pizza night. My dad thought it was great fun to spread the sauce and sprinkle the cheese on the pizza and then have my sister and I stand across the kitchen and lob toppings towards the pizza like we were in target practice. Jennifer really enjoyed that action, but I’ve always been far too Type-A. I found it much more satisfying to carefully arrange each topping on the pizza so that every bite contained the exact proportion of ingredients that I liked. Nowadays, Whitney and I make homemade pizza one or two times per month. We’re creatures of habit, so most of the time we have sausage, mushroom, and onion pizza, however this is one of our favorite alternatives. King salmon (also called Chinook salmon) is the most prized kind of wild Pacific salmon in Alaska – it is tender, flaky, and has a rich flavor. The King salmon makes this pizza decadent but not too heavy. Preheat the oven to 435 degrees F. Cook the pizza dough until it is golden brown. Remove from oven and set aside. Slice the salmon into pieces about 1/4″ thick. Set aside. In a medium pot, sauté the diced onions with the oil and butter over medium heat until they are translucent. Turn the heat down to medium-low and cook for 4-5 more minutes, until right before they begin to caramelize. Add the garlic and cook for 1 more minute. Add the cream and cook, stirring occasionally, for 10 minutes until the sauce thickens. Remove from heat and stir in thyme leaves. Spread the sauce over the cooked pizza crust. Lay the pieces of salmon on the sauce evenly across the pizza. Bake at 375 degrees F for 10-12 minutes, until salmon is cooked. Remove from oven and sprinkle with sliced chives. * You can definitely use Pillsbury pizza dough, but I have found that you can buy a ball of uncooked pizza dough from Whole Foods or your local pizza joint, and it is usually way better. **Avocado oil has a higher smoke point than olive oil, so I tend to use it for sautéing. You can use olive oil here, but cook the onions over a lower heat. In an effort to hold myself accountable to regular posting, I am starting a series called “State Dinners.” Each week I will post a recipe inspired by one of the 50 states. I’m thinking this will go in alphabetical order, but who knows? Maybe the Spirit will move and we’ll jump to South Dakota next. This first recipe is dear to my heart even though it is from the state in which the college-football-coach-who-shall-not-be-named resides. Grits have always been a staple in our household. Frustratingly, there is nothing you can rush about good grits. They need time to cook slowly and absorb the liquid. My mom taught me to make grits with heavy cream, not just water. So basically, we are making holy food. p.s. Because you probably need more butter as much as I do, which is about as much I need a hole in my head, here’s a great way to enjoy leftover grits… pack the grits into a square or rectangular dish and refrigerate. When you are ready to eat them, remove the grits and cut into 1″ slices. Heat a few tablespoons of butter in a pan until it is sizzling and lay the slice of grits on the butter. Cook for a minute or two, until browned, then flip and cook the other side. Crispy outside, creamy inside. You’re welcome. The recipe below is based on the baked grits from the Highlands restaurant in Birmingham. My recipe is more like a soufflé, gaining fluffiness from the addition of two beaten eggs and a lush consistency from the heavy cream. The grits are savory but not overwhelming – much of the dominant flavor comes from the salty prosciutto and rich Gruyere sauce. Preheat the oven to 375 degrees F. Use softened butter to grease the insides of four 6-8 ounce ramekins. Set aside. In a greased saucepan, bring 2 cups of water and 1 cup of heavy cream to a boil. Add the salt and grits and stir to combine. Lower the heat to a simmer and cook, stirring every few minutes, until the grits are thickened. This will take about 45 minutes. Stir in an additional cup of heavy cream and continue to cook for 5-10 minutes longer until the heavy cream is absorbed. Turn the heat off and stir in the butter, Gruyere, and pepper. Once combined, add the beaten egg and stir to combine. Stir the egg in quickly so it doesn’t curdle. Pour the grits into the buttered ramekins. Place the grits-filled ramekins in a 9” x 13” baking dish and add water to the dish so it comes halfway up the sides of the ramekins, probably 1″. Cover the 9” x 13” dish tightly with foil. Bake for 20 minutes. Remove the foil and continue to cook for 15 more minutes. Finally, turn the heat to broil and cook until the tops are golden brown. While the grits are in the oven, prepare the sauce. In a saucepan, bring the wine, sherry vinegar, minced shallots, bay leaf and prosciutto to a boil. Cook until most the liquid has evaporated, leaving just 1 tablespoon of the liquid in the pan. Turn the heat to a low simmer and stir in the heavy cream and a tablespoon of butter. Whisk to combine. Once it has melted, whisk in each additional tablespoon of butter one at a time, adding each piece of butter only after the last one has been fully incorporated. Turn the heat off. Pour the sauce through a strainer into a small bowl. Then pour the strained sauce back into the saucepan and add the grated Gruyere and pepper. Set aside. In a sauté pan, heat a tablespoon of olive oil and add the minced shallots. Cook for 2 minutes over medium-high heat and add the sliced prosciutto. Cook for 2 more minutes and add the chopped shiitake mushrooms. Add one more tablespoon of olive oil and cook until the mushrooms have softened and the prosciutto starts to become crisp, about 3 more minutes. Turn the grits out of the ramekins and place on dishes with the browned tops facing up. Scatter mushroom, shallot and prosciutto mixture around the grits and spoon the Gruyere sauce over the grits. Garnish with thyme. One night, we were at the restaurant with a big group and someone ordered the salad, and because I am horrified that people might think I am a picky eater (I’m not! I promise! I grew out of it! ), I decided to try it. Seriously, I could not get enough. So here’s a bright, tangy recipe for a Brussels sprouts salad (with kale added for vitamins) that I think you’ll love! *At this point, I had only had boiled Brussels sprouts. You’ll have to excuse my past ignorance. I now love them raw and roasted. Zest the lemon and reserve zest. Juice the lemon and whisk it with salt, pepper, and olive oil. Add cherries to the mixture, stir and set aside. Sauté the pancetta until crispy and brown. Remove the pancetta from the pan and pour the grease into a bowl. 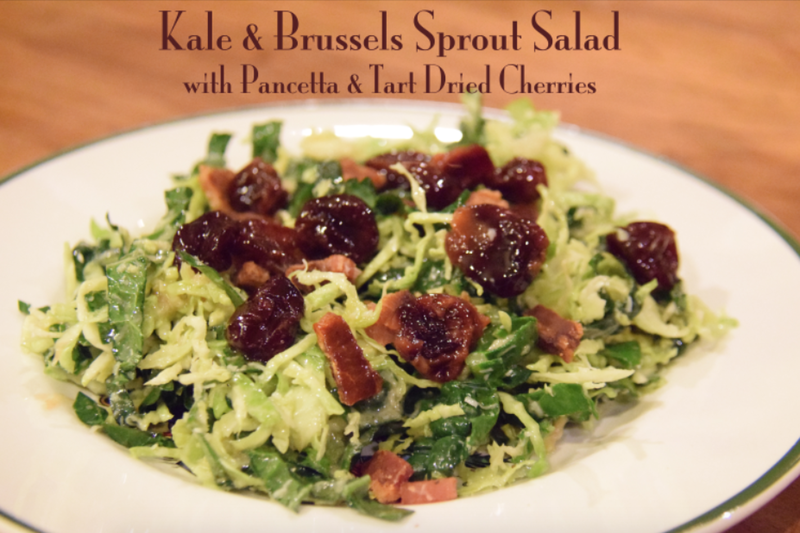 Toss the Brussels sprouts and kale in the grease, then add the cherries, dressing and pancetta. Toss everything to combine. Sprinkle reserved lemon zest on the top of each salad before serving. I am addicted to this game. Would you move to a neighborhood built around a farm? This essay made me think twice about being critical of myself – you never know what impact your careless thoughts have on someone. I seem to have adopted yoga clothes as my daily uniform, which apparently makes me appear authoritative. Beautiful slow-motion dance moves by the Washington Ballet. “Plans or no plans, keep a little space in your heart for the improbable. You won’t regret it.” And other advice that powerful women would have given their 22 year old selves. I think you all know by now how much I love the National Geographic photo contest. p.s. 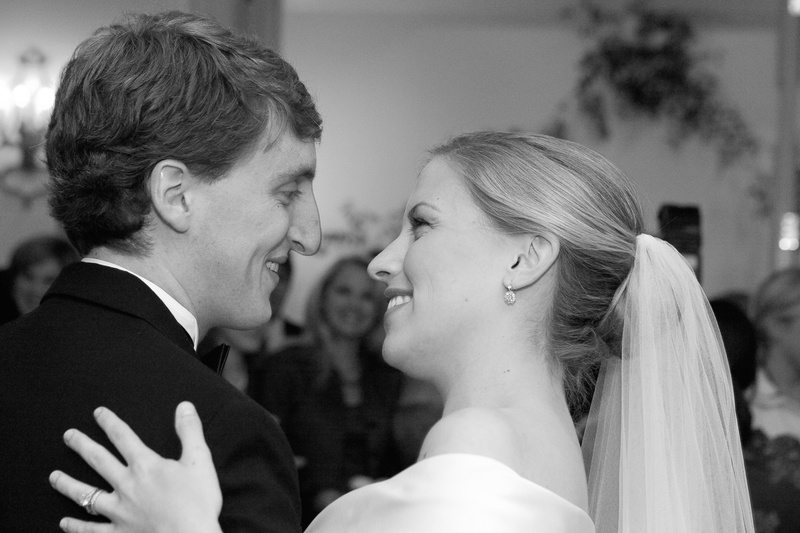 Happy 8th anniversary to my love! Cheers to us!